Habanero chiles are also extremely spicy. Through distillation, we remove capsaicin, the compound that gives peppers their heat. This non-volatile compound cannot be distilled, so the habanero has all the aroma and much of the flavor of a habanero, without any heat. Even though the distillate smells spicy, it is not. Imagine the possibilities of using a pure habanero infusion in your cocktails! 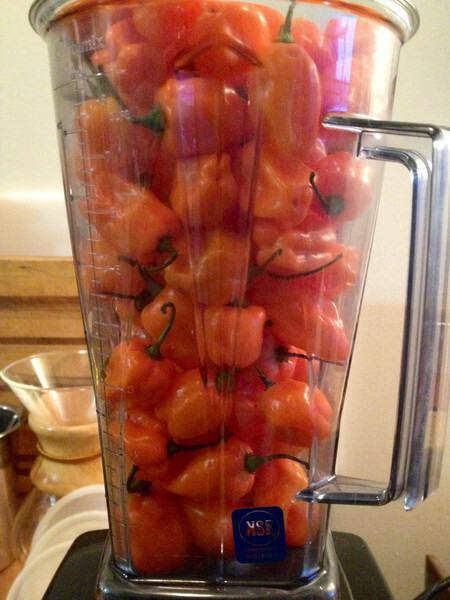 Blend habanero and water on high speed. Carefully funnel mixture into 3L evaporating flask and clamp to the vapor tube of the rotary vacuum evaporator. This mixture is extremely dangerous. Use protective eyewear and disposable gloves. Do not inhale. With the water bath at 45-50°C, and the condenser temperature starting at -12°C, apply full vacuum and rotation. Distill. Remove clamp and receiving flask. Transfer distilled habanero to clean vessel or vacuum seal. Distillate can be refrigerated for 3 weeks or frozen up to one year. Remove and carefully dispose of concentrated habanero puree. CAUTION: THIS PUREE IS STILL EXTREMELY SPICY. Thoroughly wash all glassware, as habanero distillation tends to leave residual flavors after rinsing.